Absolutely! And it has absolutely no side effects. Love this idea, bet we can get a lot of kids off medicine with this technique. I met a 5 year old the other day who was on anxiety meds, it broke my heart. Thanks for joining #momsterslink, I’m having a blast as guest host. Good luck! Start slow and remember that just trying is a success. Gotta love babies. Thanks for reading! So many children could benefit from learning mindfulness. Impulsiveness, immediate gratification, anxiety, depression… things we see in schools every day. This is a terrific post and I’m glad I found your site through the #BloggersPitStop. My wife and I recently learned about mindfulness practices while our son was having difficulty transitioning to his new high school. Now, when he becomes anxious about school, we practice mindfulness together at home and he practices it himself on the way there and in class, if need be. It’s tremendously helpful. Thanks for sharing so other parents can learn this tool to help their children, too. I love seeing the Pit Stop Banner flying here. I still haven’t forgotten about the screenshot I promised you. 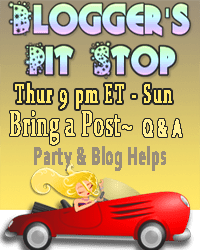 Thanks for sharing your post at Blogger’s Pit Stop last week.